Jim Blackler · Offline Solitaire, an HTML5 browser application and Chrome application. 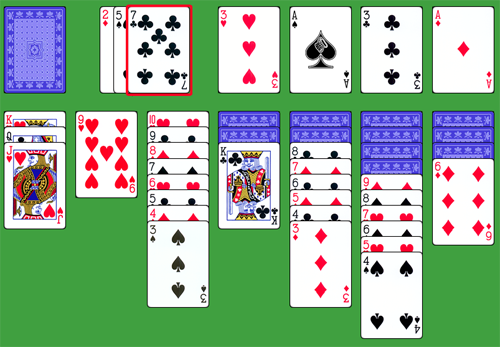 Offline Solitaire, an HTML5 browser application and Chrome application. Does the world really need yet another implementation of Solitaire for the browser? Yes, absolutely! When I acquired a Chromebook recently I looked for Solitaire Chrome apps (my gaming tastes aren’t particularly sophisticated) only to be disappointed by over-presented apps heavy in Flash and Ad-laden. I just wanted an implementation of regular Klondike Solitaire that matched the simplicity of the old Windows-bundled version. The one played for years by bored office workers worldwide before the internet took over as principal time-wasting activity. Also I wanted one that would work offline (when user have no internet connection). Solitaire is an ideal activity on the plane or train. Another motivation was simply that I felt like writing a card game having never developed one before. Also I wanted to understand how feasible the idea of offline browser applications is. It was developed using Eclipse and Chrome Developer Tools. Cards were adapted in Photoshop and Inkscape from public domain and Creative Commons resources. Great stuff for my green cocoon stays in the forests of Sweden, where data isn’t always in the air. Thanks for writing Offline Solitaire. I play it often on my Chromebook. I’m having a slight problem on Ubuntu 12.04. I’m playing using Chrome Version 26.0.1410.43. I did something to lock up the game and now each time I go back in to play I have a green background with the deck not dealing out to start the game. The “settings” wheel is unresponsive. I’ve tried exiting the browser and going back in but t hat doesn’t work. I am assuming there must be a way to reset the data the game uses. This is a problem with the settings wheel not being clickable because the way the game is written currently it does show you the end of the old game when you go back (in retrospect I should have made the redeal automatic when you hit refresh). That will reset your game. It’s a workaround but it should fix your issue. There are other ways to reset the local data probably in Chrome settings. I have been playing your Klondike Solitaire and like the lack of so many additional features, like scoring, and Vegas scoring, and lots of other features that I am not interested in having. Recently, when I am playing a game, a portion of the cards (such as when I have a line of 7, then 6, then 5, etc.) and these cards keep moving. They are not the ones that I could use next, the line of cards just keeps moving and it is distracting and irritating! What can I do to get rid of the movement? Thanks for your help. I hope I explained the problem accurately. Sorry Judy. I’m not sure what you’re seeing when you say the cards are moving. I am have a problem with the ace of clubs. Most of the time, it will not let me play it or won’t let me play it until other aces are played. This happens 80 percent of the time. An update will go live in the next few weeks. I hope that will fix your problem.